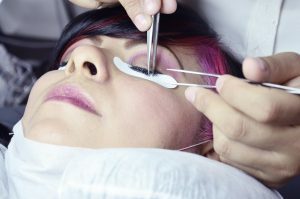 For women who have short eyelashes, the dream of having a more sensual look may seem a little closer thanks to the techniques of eyelash extensions. False lashes are glued one by one at the base of the actual lash to add volume and length. When done by a professional, the final result is a quite natural, but fascinating look. The eyelash extensions can be synthetic, mink, sable or silk lashes. You can also choose between different lengths, curl and thicknesses. Lashes are enhanced by adding subtle length and volume, suited for those who don’t want their extension to be noticeable. Among the options available there are the One to One extension and Russian volume extension. The false eyelashes are applied one by one along natural lashes, and usually, the extensions are a bit thicker to give volume to the lashes. This technique is most recommended for women who want powerful, volume-rich eyelashes. To create this effect the professional attaches multiple lashes to each natural eyelash. The eyelashes are thinner and lighter, so it’s possible to fit 2 to 8 extensions to the natural eyelash. Do not be fooled by the dozens of internet tutorials that guarantee that it is possible to achieve a good result by doing it at home. Misplacing eyelashes can result in loss of natural lashes and eye irritation. Look for good professionals. Some people may have a sensitivity to the glue used for the extension. Therefore, it is important to test in a small region before applying the product along the entire lash line. Simple care makes the procedure last much longer. The main thing is not to expose your eyes to high temperatures or water in the first 24 hours. This is because the glue has not yet fully attached to the skin and the threads can come loose. In the following days, you should avoid rubbing your eyes or sleeping face down on the pillow. Never use anything oily in the eye region, and avoid the eyelash mascara as it decreases the durability of the eyelash extensions. Remove your makeup with Micellar water only, and brush the extensions once a day with an old mascara brush. Even taking all necessary care, your eyelash extensions will last approximately the time the natural lash cycle lasts: from six to eight weeks. We don’t recommend eyelash extensions to people who have Blepharitis. Avoid extensions if you have some allergy to glue. It is important to be aware of the quality and origin of the glues that are used for the application of the eyelash extensions. Poor quality can cause allergies in people with the most sensitive skin.